Native Americans in Northern Minnesota do not have to go far to find relief from the challenging and harsh realities of living so far from their reservations, homes and communities. 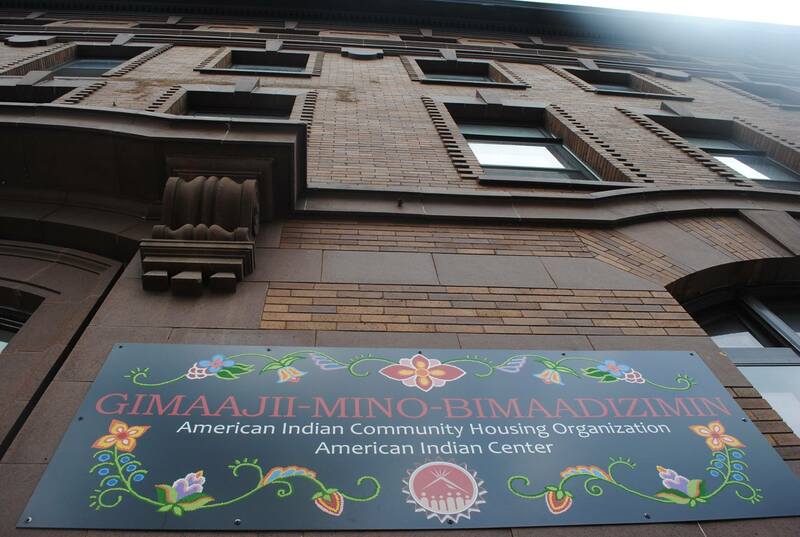 The American Indian Community Housing Organization (AICHO) in Duluth provides culturally specific services ranging from homeless housing, to permanent and transitional housing, to a domestic violence shelter and other social services. AICHO was established in 1993 by the Native American women living in the Duluth area who saw a need in their community. The women at AICHO continue to steer the organization to grow and expand their services to strengthen the communities they serve. 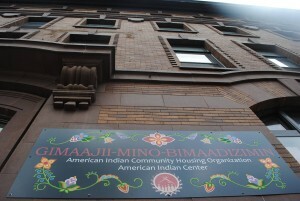 AICHO runs the Gimaajii-Mino-Bimaadizimin (“We are, all of us together, beginning a good life”), which is home to Duluth’s urban Indian center and 29 units of permanent, supportive housing for homeless individuals and families. AICHO also provides a space for community events such as feasts, elder talks, book signings and workshops. There is an auditorium, a rooftop garden and a gymnasium. However, it is the AICHO Galleries that are at the heart of the organization and bridge the residents of the AICHO housing programs with the Native American and Duluth communities. Leah Yellowbird is First Nations Algonquin-Metis and Anishinaabe, and she knows firsthand how AICHO can transform one’s life. She recalls how Michelle LeBeau, AICHO executive director, contacted her about doing an art show at AICHO. LeBeau saw a painting of Yellowbird’s on Facebook and knew she’d be great to feature in one of their early art shows. “AICHO gave me my first show ever … It changed my life and I am sure for others, too. Small things bring many possibilities,” said Yellowbird. Yellowbird has such a connection to AICHO that she moved from Grand Rapids, Minnesota, to Duluth to be near AICHO and continue to contribute to the community with her art. In 2012 AICHO began working with emerging artists to learn how to hang and label their art, and the numerous other details they needed to grow as artists and entrepreneurs. As the artists learned as they went, so did the AICHO staff. They established a 15-member advisory board made up of area artists, and scheduled ongoing art shows. However, after a few years it was clear that the art program needed to grow, but AICHO didn’t have the financial capacity to expand the galleries. 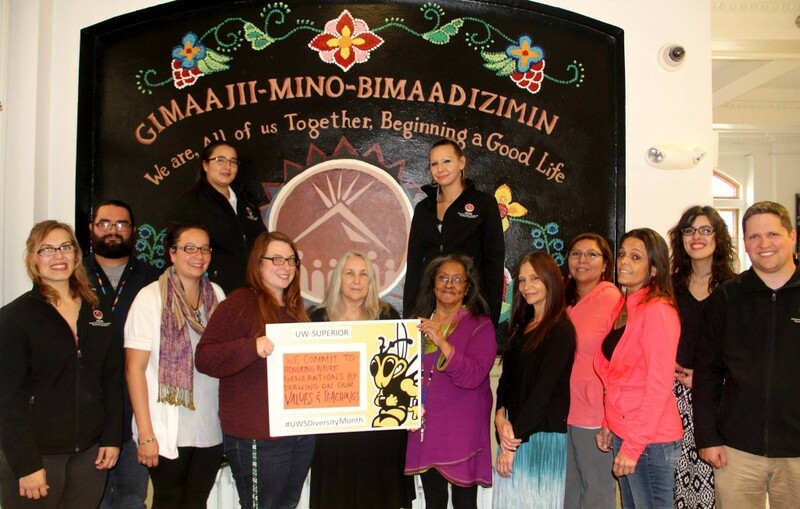 In 2015, AICHO received a First Nations Development Institute Native Arts Capacity Building Initiative (NACBI) grant, funded by the Margaret A. Cargill Philanthropies. The goal of NACBI is to strengthen the organizational, managerial and programmatic capacity of Native organizations to serve the field of Native American arts and artists. By building capacity, these organizations will be better positioned to advance opportunities for Native artists, who are striving for economic self-sufficiency and cultural preservation in their communities. 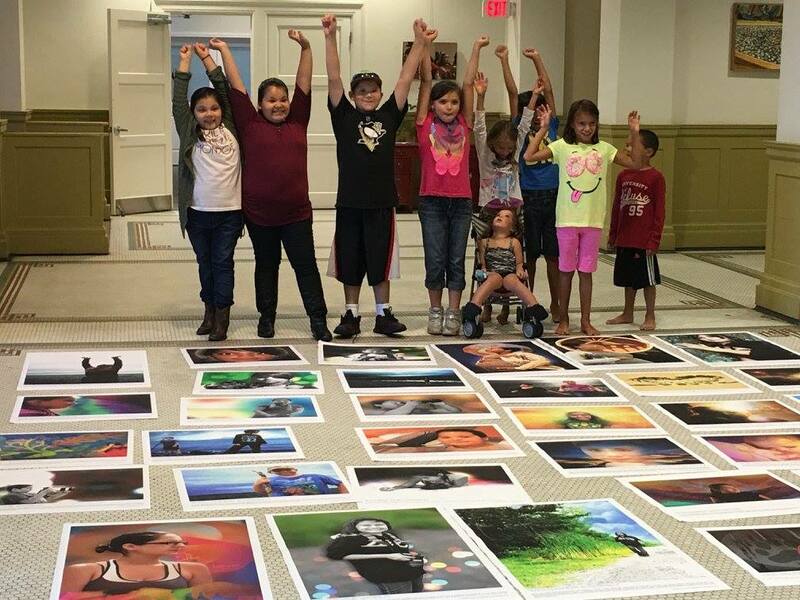 The NACBI grant funds existing Native American arts programs supporting Native American artists in Minnesota, North Dakota, South Dakota and Wisconsin. “The NACBI grant opened the door to all these other opportunities we didn’t have access to. It caused an explosion, and it solidified we knew what we were doing,” said LeBeau. AICHO’s Gimaajii-Mino-Bimaadizimin Artist/Community Collaboration project has provided artists – primarily from the Fond du Lac Band of Lake Superior Chippewa, the Bois Forte Band of Chippewa, the White Earth Nation, the Mille Lacs Band of Ojibwe, the Leech Lake Band of Ojibwe and the Red Lake Nation – with an opportunity to showcase their art through shows. The artists have also taught workshops with the AICHO residents, furthered their artistic skills, helped develop their professional skills by creating a portfolio, and digitizing and documenting their work. The artists learned to network and how to seek funding to promote themselves as artists and entrepreneurs. One of the artists who had her first show at AICHO back in 2013, when she was just 18, was Moira Villiard, who is from Fond du Lac. 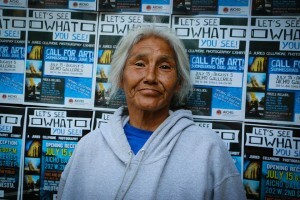 She recalls how she was painting portraits when LeBeau asked her to show her work, but she didn’t have anything ready. The AICHO staff helped her frame her work, and get it hung and labeled. AICHO was so pleased with her first show that they commissioned Villiard, Laurel Sander and Christina Trok to paint a mural outside Trepanier Hall, which is part of the Gimaajii-Mino-Bimaadizimin building. She also taught workshops to AICHO residents. Villiard’s enthusiasm and love for the organization is evident. While attending college prevented her from working full time, she stayed connected to AICHO as much as she could. “When you really believe in the project, it’s hard not to help,” said Villiard. In May 2016, after she graduated from the University of Wisconsin-Superior with a Bachelor of Science in Communications degree, Villiard went to LeBeau to see if there was a place for her at AICHO, and there was. The funding received from the First Nations NACBI grant enabled LeBeau to hire her as the cultural programs coordinator in June 2016. Villiard was ready to take her passion for art and her connection to the AICHO community into a more formal, official setting. 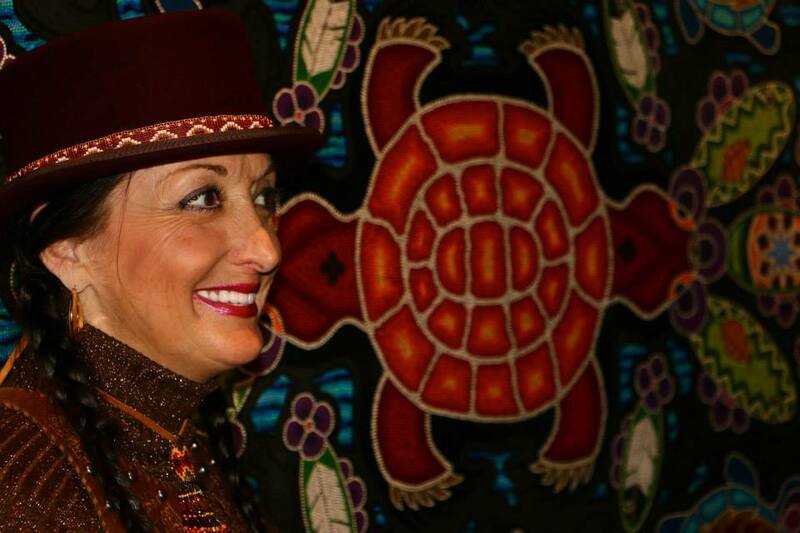 She knows firsthand the challenges Native artists face in finding time to devote to their art, to finances, and the struggle to market themselves as artists and entrepreneurs. The NACBI grant allowed AICHO to further the growth of the AICHO Galleries and the feedback from the emerging artists has been positive. Many credit AICHO and the established artists for their success by giving them encouragement and the confidence to build their art careers. The artists learned how to make connections and take advantage of opportunities they might not have had on their own. Many felt AICHO helped to launch their art careers by giving them the opportunity to hold a solo show. The donation of art supplies and the funding of prints and scans of their work furthered their creative process and the availability of their work. Villiard said the more established artists in the community provided the support and mentoring needed by the emerging artists. In turn the artists give back by teaching art workshops with the residents, and being involved at AICHO on the ground. 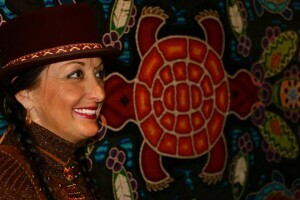 More than 45 established and emerging artists have come through the AICHO Galleries including Ivy Vainio, Jonathan Thunder, Karen Savage-Blue, Vern Northrup, Lyz Jaackola, Wendy Savage, Rabbett Before Horses Strickland, Steve Premo, Laurel Sanders, Rocky Makes Room For Them, Villiard and Yellowbird. 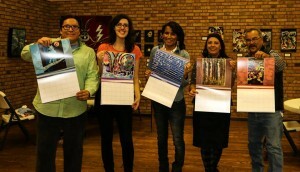 AICHO also produced an art calendar for the last three years. The 2016 calendar featured all the Ojibwe bands in the state, the Red Cliff and St. Croix Bands in Wisconsin, and Rosebud Lakota. Each month featured a different artist and the months were translated into the Ojibwemowin language. The 2017 calendar will feature images from the Gimaajii Children’s Art Exhibit – “Through Our Eyes” – and it will be available on AICHO’s website starting December 1, 2016. 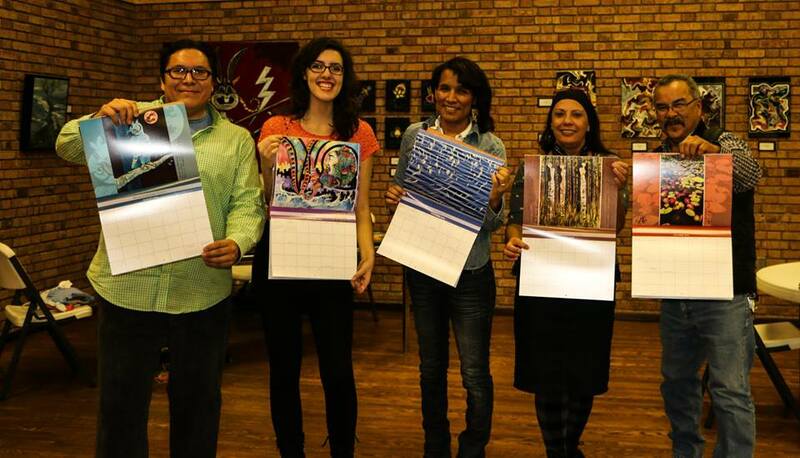 Sales of the calendar support AICHO’s programs and show the strong ties the artists have with the AICHO community. The power of the art shows in connecting the residents to the artists and the art community in Duluth is evident. 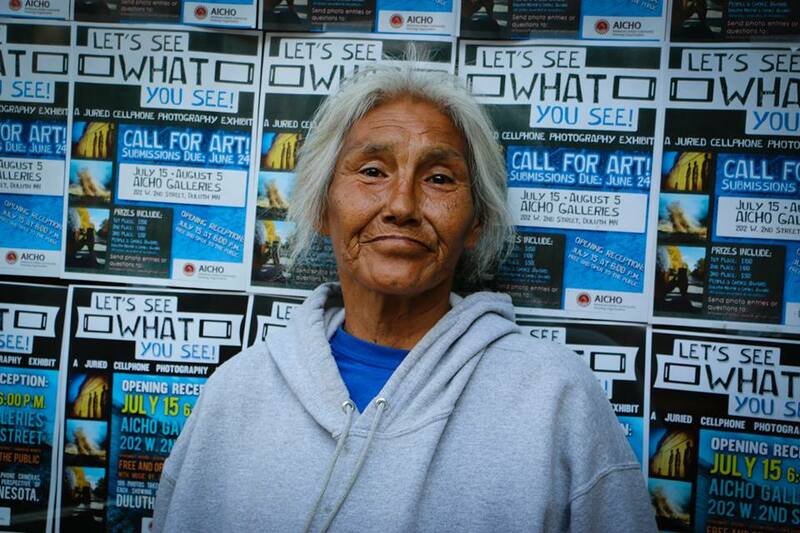 “In the time I’ve been here, I’ve seen the art shows bring the outside community into AICHO and raise awareness of what we do here. It creates a conversation and a window into the organization, and a broader conversation. It’s a powerful tool. It’s a crucial, therapeutic experience for the residents,” said Katie Rider, AICHO finance manager. AICHO estimates that more than 10,000 people came through their doors over the last year, with half due to the arts programing. The AICHO residents, artists and the Duluth community are dialoging and connecting in ways that have not happened before. AICHO has seen an increase in donations and assistance from the Duluth community to fill the need for furniture or other necessities for the housing programs, by donating pieces or being on the lookout for what AICHO needs. The artists, their energy and their work bring people into the building for an evening of the arts, but what patrons get out of it is so much more. The spotlighting of emerging and existing Native artists, who might not have a place to exhibit their work, and connecting the residents AICHO serves with the artists and the Native and Duluth communities, does not happen without everyone’s contribution. The art programming is a team effort, which is evident when talking to Olson and Rider, who volunteer their time with other staff to shop for food, set up, serve and clean after the art shows. The committed staff members, however, give high praise to their colleague Cheryl Stone, who is from the White Earth Nation. Remember the “remarkably” displayed artwork in the galleries, which made such an impact on young Moira Villiard? Stone is the person behind the gallery magic and is AICHO’s property manager. She lives on-site. Since the art shows began, Stone has played a vital role in meeting with artists and driving miles to pick up and frame the art with the artists. Stone goes through every single step with the artists to the final act of hanging the art. She takes pride in making sure it is displayed well, as the art is a reflection of the community. The art is important to all involved with AICHO, as the art reflects the world they have created and care for, and will do so for generations to come.